Call us on 07 5477 1222 – we are always happy to help! Standard shipping is offered at no charge using Australia Post regular post. 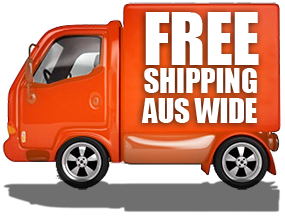 Times may vary depending on Australia Post handling time and also your location within Australia. All Orders received prior to 10.30am of stocked items will be shipped same day. Orders placed after 10.30am will be shipped next working day. If a product is not available immediately, we will notify you and give you the opportunity to cancel your order or allow us to place it on back order, in which case it will be shipped as soon as we receive it. Exchanges and refunds will be given where goods are faulty.